The following article by Steve Brandt was published in the March 26, 2016 issue of the Star Tribune. 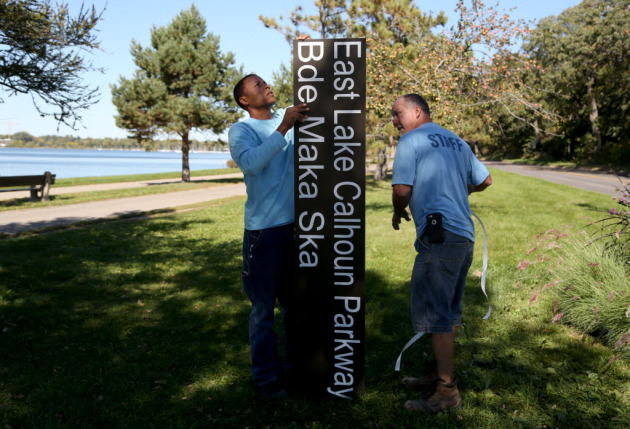 An advisory group on Tuesday overwhelmingly urged the Minneapolis Park and Recreation Board to support restoring the name of Lake Calhoun to the Dakota Bde Maka Ska. The 15-4 vote ratifies an informal position the group advising the board on Calhoun-Harriet renovations took last fall in favor of the name restoration. The appointed group urged the board to advocate for the name restoration with other government bodies that would play a role. The proposal to delete Calhoun’s name originally arose from the 19th century politician’s outspoken advocacy for slavery in the American south. But native American activists added momentum to the push, citing Calhoun’s policy of forced relocation of southeastern tribes. They say the issue is restoring a Dakota name in use when whites arrived in the area. The proposal has aroused widespread debate. Opponents of changing a long-used name argue that applying present-day attitudes to historical figures is a slippery slope. They also contend that the Dakota name is hard to pronounce. This entry was posted in Lake Calhoun on March 29, 2016 by citoyen1789. The following article by Eric Roper was published in the March 26, 2016 edition of the Star Tribune. Mayor’s plan: $30M per year for 10 years to close the funding shortfall. Minneapolis Mayor Betsy Hodges, shown in February. Minneapolis Mayor Betsy Hodges said Friday the city should commit an additional $30 million for 10 years to close projected funding shortfalls for roads and parks — and raise taxes to pay for it. She released a basic outline of the $300 million plan with City Council Member John Quincy on Friday. It would mean boosting the city’s levy — the dollar amount it collects in taxes — 1.4 percent more per year than the previously forecast average of 3.5 percent. The proposal comes days after Hodges vetoed another plan to fund needed park improvements over 20 years by largely relying on funding sources within the city’s existing budget, including pension savings. Hodges said those sources are too unpredictable for the long-term commitment. This entry was posted in Budget on March 29, 2016 by citoyen1789. Here is the statement given by Arlene Fried, co-founder of Park Watch, during the Lake Calhoun-Harriet CAC meeting on March 24, 2016. I am in support of retaining the name Lake Calhoun. The names and the assets are linked together. And so Lake Calhoun–the asset and its name are linked together. As custodians of all of the assets in our esteemed park system, it is our Park Board commissioners’ fiduciary responsibility as commissioners to protect and preserve these assets; and that means protecting and preserving our lakes and the names attached to them. This entry was posted in Lake Calhoun on March 28, 2016 by citoyen1789. The following article by Eric Best, dated March 25, 2016, was published in the Southwest Journal. The following article by Peter Callaghan was published in the March 23,2016 issue of MinnPost. The Park Board is looking for funding to update and renovate neighborhood parks and recreation centers. When it came time for her to vote, the president of the Minneapolis Park & Recreation Board wanted to make clear where she stood. “HELL, yes,” said Liz Wielinski after her name was called. And with that, the board was unanimous in endorsing a 20-year deal with the city of Minneapolis to provide money to repair and restore 157 neighborhood parks and facilities. This entry was posted in Budget on March 23, 2016 by citoyen1789. “It’s a real moment of truth,” said Adam Duininck, chairman of the Metropolitan Council, builder of the transit line. The Met Council must coax $135 million from lawmakers during the short legislative session this spring to qualify for federal matching funds of $895 million. Without that state match, the 14.5-mile line linking downtown Minneapolis to Eden Prairie could be imperiled — after about $118.5 million in local money already has been spent on it. This entry was posted in Southwest LRT on March 22, 2016 by citoyen1789.